SNAME Spring Meeting (continued from page 23) for the U.S. merchant marine in time of war or national emer- gency. They are (1) military aux- iliary, (2) defense resupply (3) security of economy, and (4) commerce. In times of peace, the reverse hierarchy applies to commercial ship operators. There is evidence that in the past this reversal of objectives did not create any significant divergence of requirements affecting vessel design. A number of changes have occurred in recent years which have resulted in a mis- match of design requirements for peacetime commercial and war- time national interests. This pa- per discusses these changes and recommends a methodology by which ships from the contract dry-cargo fleet can be selected for wartime use. Factors in Naval Ship Design" by J. Castle, R. Feaga and A.
Daniel Weiler, Hotel Arrangements itary Personnel problems which are affecting fleet readiness and operating costs. These problems and effects could worsen as the pool of skilled personnel available to the Navy decreases and as it expands to a 600-ship fleet. A primary cause of these problems is inadequate considerations of human factors in ship design. This paper discusses Navy per- sonnel problems, design-related causes and what is being done to better address human factors in naval ship design. SYNOPSIS: Ships under the ju- risdiction of the U.S. Coast Guard are required to have a drydock inspection every two years. Off- shore oil rigs and bulk carriers have become so large that a bi- ennial drydocking is a problem. Coast Guard to accept under- water inspection in lieu of dry- dock inspection on selected ships. Contribution to Maritime Indus- try Productivity — 1982" by A. D'Amico, J. Puglisi, J. Schryver and H. Taylor. 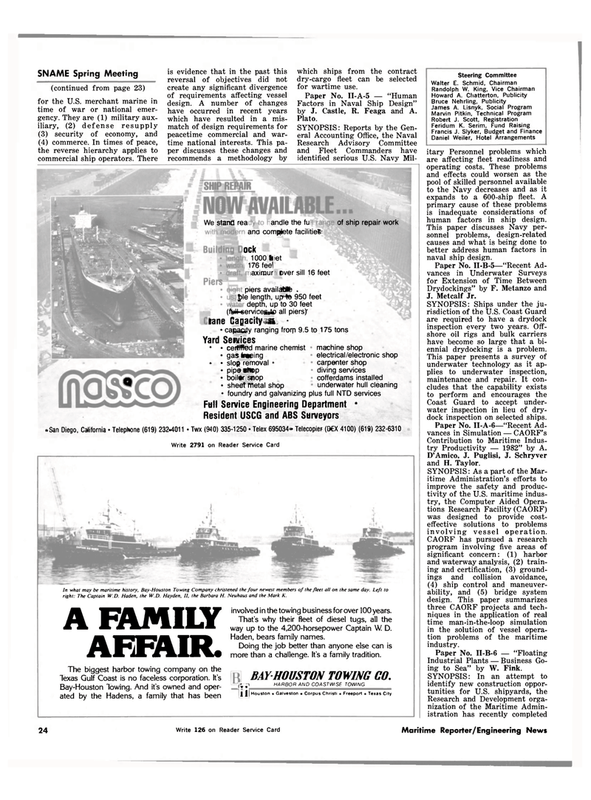 SYNOPSIS: As a part of the Mar- itime Administration's efforts to improve the safety and produc- tivity of the U.S. maritime indus- try, the Computer Aided Opera- tions Research Facility (CAORF) was designed to provide cost- effective solutions to problems involving vessel operation. CAORF has pursued a research program involving five areas of significant concern: (1) harbor and waterway analysis, (2) train- ing and certification, (3) ground- ings and collision avoidance, (4) ship control and maneuver- ability, and (5) bridge system design. This paper summarizes three CAORF projects and tech- niques in the application of real time man-in-the-loop simulation in the solution of vessel opera- tion problems of the maritime industry. Industrial Plants — Business Go- ing to Sea" by W. Fink. In what may be maritime history, Bay-Houston Towing Company christened the four newest members of the fleet all on the same day. Left to right: The Captain W.D. Haden, the W.D. Hayden, II, the Barbara H. Neuhaus and the Mark K.
Bay-Houston "lowing. And it's owned and oper- ated by the Hadens, a family that has been involved in the towing business for over 100 years. That's why their fleet of diesel tugs, all the way up to the 4,200-horsepower Captain W. D.
Doing the job better than anyone else can is more than a challenge. It's a family tradition.